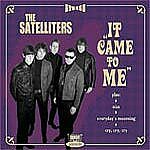 After many releases by the best garage-labels around the world, e. g. Dionysus (USA), Screaming Apple (GER), Demolition Derby (BEL) now SOUNDFLAT RECORDS proudly presents THE SATELLITERS, coming with their newest 4 track-single 'It Came To Me', limited of 500 copies. 4 exclusive fuzz-garage pearls on our premium label for Beat- & Garage-music. The title track 'It Came To Me' is a tribute to the Dutch Q65. This version of the mid 60's-classic from THE SATELLITERS is both, it follows the original in an authentic and electrifying way and comes along with an art-typical SATELLITERS-goody. That is the finely tuned portions of organ and fuzz, what always refines their sound. Wow, a garage-punk version, which would even amaze Q65. But the other 3 masterpieces of this 7', penned by THE SATELLITERS, can easily keep up with it. 'NICE" is a hard mid-tempo shaker with Medway flavour. The 5 garage heroes from Darmstadt (GER) perform the next cracker 'Everyday's Morning' as a quick and wild garage-punk explosion, supported and driven by organ, geared to the original 60's punk bands. Moreover, this first class single is finely adjusted by the psych-garage stylistic song 'Cry Cry Cry', topped with throughout and fuzzy lead guitar, hard hook-breaks and sitar. The artful and classy cover is designed by TORSTEN ESCHWEILER, who is, for some people, better known as Monsignore Boogaloo. It is really a first-rate work and will impress you with the laborious cardboard cover. For the hard and unique 60's garage-acid sound of THE SATELLITERS it is, as all garage-heads worldwide know, not easy, to draw an appropriate comparison. But if you would do so, bands like THE MIRACLE WORKERS, THE CHESTERFIELD KINGS and THE CYNICS! can receive a mention. As you see, it would be outrageous, if you don't acquire one of these - limited on 500 - copies. Since you are unable to answer the question: is there another today's band, who accomplishes it, to create such an authentic 60's 'fuzz- and acid sound' for their and your best? So you may rest assured that exact this specific sound can be found on this recording with one hundred percent certainty!